Belgian Surrealist René Magritte’s masterpiece The Castle of the Pyrenees was commissioned by the artist’s longtime friend, the international lawyer, poet, and author Harry Torczyner. The unfolding of the commission and evolution of the painting are documented in letters between the two men, which were published by the Israel Museum in 1991. Though Magritte had complete freedom, the correspondence reveals that his patron was encouraged to express his opinions on the choice of a subject. 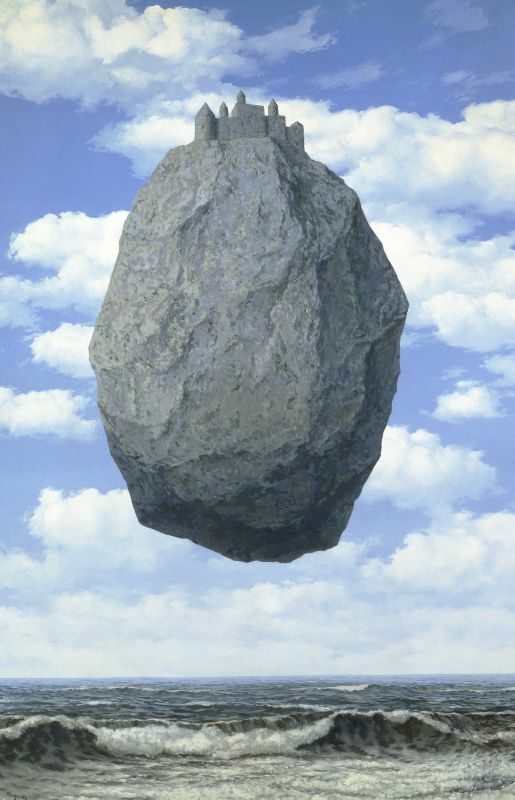 From a number of drawings proposed by Magritte, Torczyner selected one of a large rock surmounted by a castle. Intimately acquainted with the artist’s repertoire, Torczyner added the suggestion of a sky on a clear day and a rough darkish sea “because over the dark sea or ocean there rises the rock of hope, topped by a fortress, a castle.” As Magritte refined the painting, he decided to exclude other proposed additions so that it would retain the “vigor” and “harshness” he envisioned. The Castle of the Pyrenees has become one of Magritte’s best known and most-reproduced images. It embodies the artist’s typical disturbing juxtaposition of familiar objects, combined with captivating poetry and mystery.